Alexandra House understands that education is critical to creating significant, long-term change. We offer free presentations and facilitated dialogues to community groups and individuals on the basics of domestic and/or sexual violence, signs, intervention, and awareness. This is a non-threatening way to learn more about the issues and take a stand through partnership with Alexandra House. Participating groups have included faith-based groups, civic and service clubs, and social justice–oriented organizations. We will craft the presentation to fit your group’s specific timeframe and goals. If there is a topic that is not listed here, please email the Communications Department at communications@alexandrahouse.org and we will be happy to discuss that with you. In 1990, an ad hoc group of women, upset about the growing number of women in Minnesota being murdered by their partners or acquaintances, joined together with several other women’s organizations to form Arts Action Against Domestic Violence. The women designed 26 free-standing, life-sized red wooden figures, each one bearing the name of a woman who once lived, worked, had neighbors, friends, family, children—whose life ended violently at the hands of a husband, ex-husband, partner, or acquaintance. In 1992, Alexandra House created its own Silent Witness exhibit to commemorate the lives of the women and children whose lives had been lost in Anoka County as a result of domestic violence. It is part of a larger effort consisting of more than 300 exhibits nationwide with the goal of ending domestic violence homicides. Our Exhibit consists of 24 red silhouettes representing Anoka County residents who lost their lives to domestic violence. Each bears their names and tragic personal stories making a dramatic statement and offering a powerfully moving testimony to the devastating impact of domestic violence. 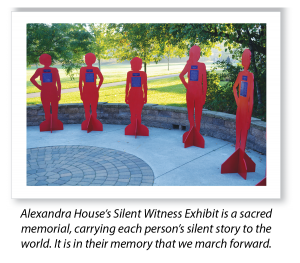 The Silent Witness silhouettes have been exhibited at events and locations across Anoka County. We invite you to arrange for a Silent Witness Exhibit for your organization or place of business. The exhibit can be tailored to fit your specific space requirements. For more information on reserving and displaying the Silent Witness Exhibit, download our Requesting the Exhibit information flyer and the Silent Witness Exhibit Request form below. You can also read all 25 of the profiles for the exhibit.